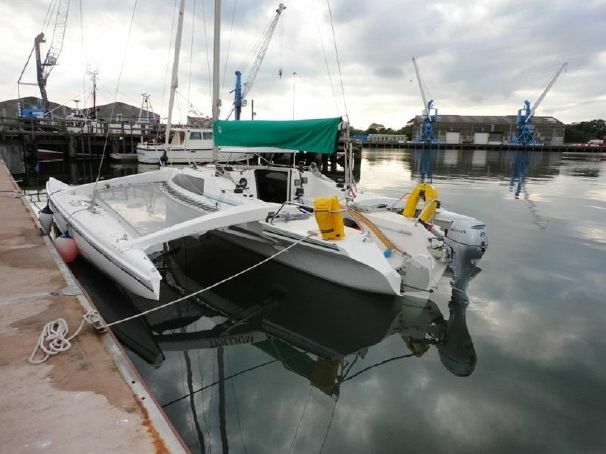 We don't get a lot of multihulls to review, but there are definitely more and more of them appearing. We can debate the merits of multi versus monohull, then add light displacement versus heavy and throw in transom stern versus canoe stern. 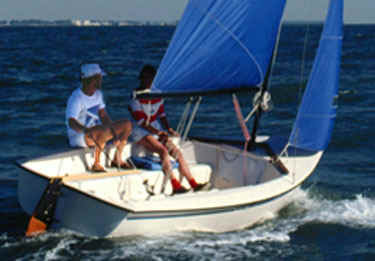 The fact is we all have our own sailing style and that style may have little to do with velocity made good. 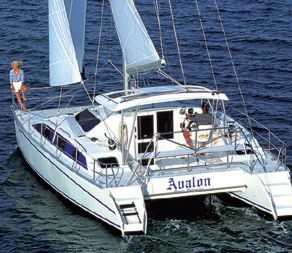 So I sit there, bobbing along in my friend's Blowfish 29. There is little to do other than try and make the boat go faster. OK, let's ease the genoa halyard and pull the traveler up to weather a bit. See, there's an additional half a knot. The quest for speed and sailing efficiency becomes a centering device for the rest of life at sea. 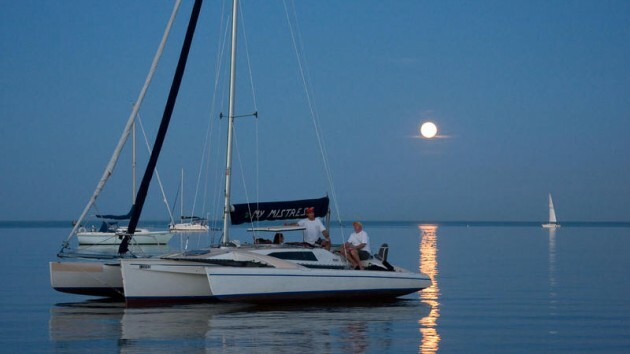 With this in mind, it is easy to see how many sailors are attracted to the world of multihulls with their sometimes delivered promise of higher speeds. 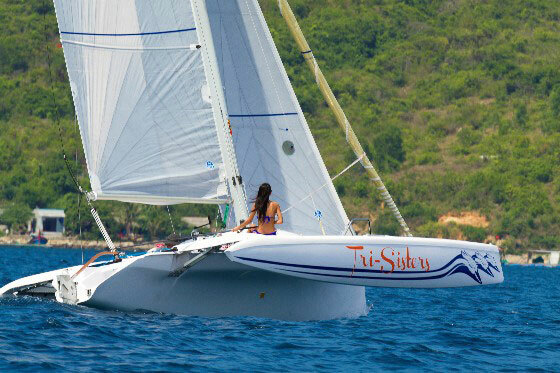 The move from mono to multihull seems to be more of a philosophical move than a velocity made good decision. 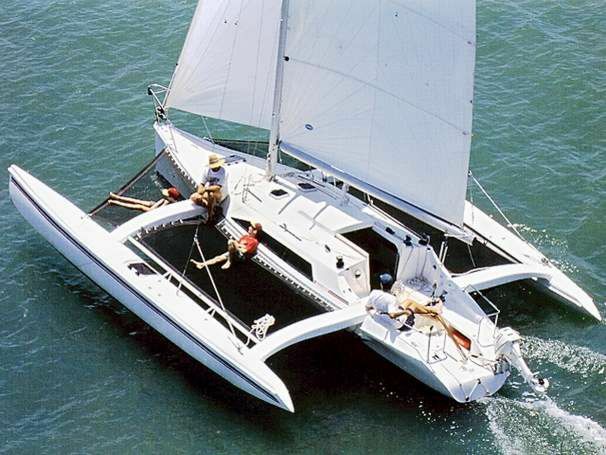 I don't think I have seen any multihull design capture the attention of monohull sailors as the Corsair F-27 has. The F-27 combines unusual features that, while none is new, blend well together in this design to produce an attractive vessel. Probably the most important aspect of this design is trailerability. My pal John owns an F-27 and he keeps it on the trailer all the time. From the road to under way, ailing takes about half an hours. This opens up a new world of potential cruising grounds without resorting to a charter. Of course, the trailerability of this design is made possible by the folding outriggers and the resultant trailerable beam of 8 feet 6 inches. One of the major drawbacks to this is the difficulty of finding dock space. This is a non-problem with this vessel. The F-27 is not cheap nor is it available tomorrow at your local dealer. You are going to have to pay around $66,000 for a well equipped F-27 and unless you can find a dealer willing to sell his demo, you may have to wait six months for delivery. This and the fact that more than 100 F-27s have been sold in the last 12 months indicates something is happening here. 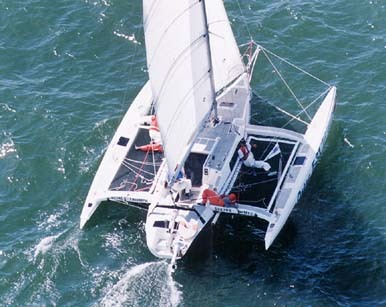 The designer of the F-27 is New Zealander Ian Farrier who settled in Queensland, Australia, and started with a folding 18-footer. Farrier now live s in Southern California and runs Corsair Marine. When you bring up the subject of performance and trimarans you will invariably hear "They don't go to weather and they capsize." Given the right circumstances, you can most probably capsize any unballasted boat regardless of the number of hulls it has. I once capsized a keelboat I owned that had a 50 percent ballast to displacement ratio. "We'll be up in a second, mates." Right. The Swan 65 Sayula capsized as did the C&C 61 Sorcery. They did, however, pop back up on their own with Sayula going on to win the race. F-27s have completed numerous ocean passages and ocean races with 250-mile days being commonplace. I called my friend John and asked him about the speed of the F-27. Everybody has the day when they hit 27 knots as they beam reached across the sound in their Blowfish 29. I was not interested in optimum max speeds. I was interested in one thing. "Tell me which boats you sail boat-for-boat with on the race course." We both race in the same local fleet so benchmarks were easy to establish. On a typical Puget Sound day, the F-27 would sail boat-for-boat with the J/35 and easily outsail a J/40. 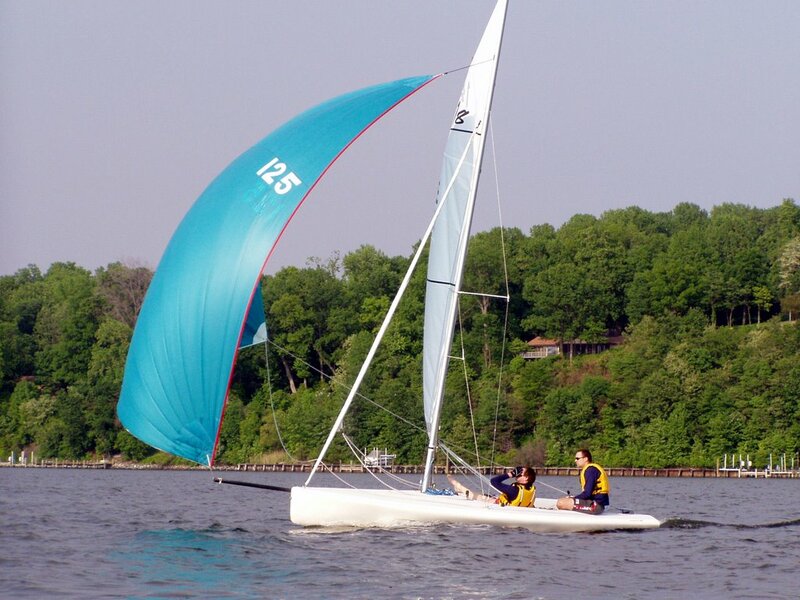 Speeds of over 15 knots are well documented and easily achieved in a breeze. Upwind speeds of nine knots and better are also claimed. Heel angle rarely exceeds 12 degrees, making movement on board the F-27 easy. Does this design have drawbacks? Weighing only 2,800 pounds, it should not surprise you that the F-27 is not roomy and spacious. Nor does it have a lot of storage space or copious tankage. You should not put two anchors on the bow and carry 300 feet of 5/16ths chain with your F-27. 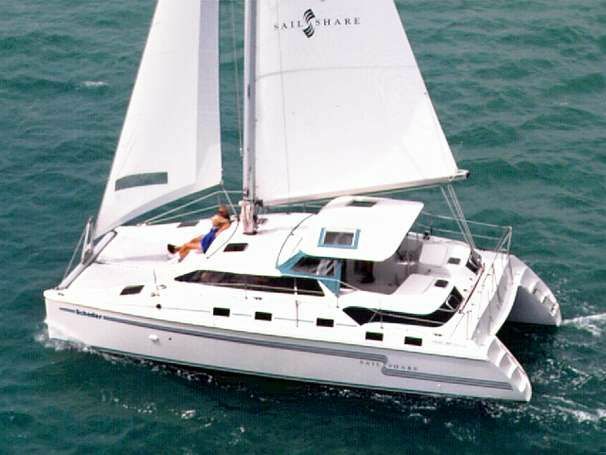 The accommodations are tight and roughly equivalent to a 26- or 27-foot monohull. The unballasted and unsinkable F-27 is built with PVC core using S-glass, with Kevlar and carbon fiber in the stressed areas. The laminate is "vacupressured" to optimize the structural properties. The outriggers are held in place with one bolt each, although the bolt is not needed due to the loads being absorbed by the folding struts beneath the outrigger arms. This folding system was designed by Farrier in 1973 and has proven trouble-free. John just called. "Do you want to go for a sail?" "Well, it's blowing zero to three knots and I'm deep into these reviews so I will pass for now." I promise, dear reader, that I will take John up on his offer soon and give you a detailed account of my sail aboard the F-27. Sail Area 456 sq. ft.